This review was first posted on Music, Books and TeaThe first thing I need to say in this review is that Finding Sky is one of my favourite paranormal reads of this year. I honestly didn’t know what I was letting myself in for when I started reading it, I had a feeling I’d enjoy Finding Sky, but nowhere near as much as I actually did.I adored the idea of Savants and Soulfinders. It was really interesting to read a paranormal book that didn’t involve vampires or werewolves, but simply humans with supernatural powers. The idea of a soulfinder was quite bittersweet too. Each savant has a soulmate, born around the same time as themselves, and without their soulfinder, they will never reach their full potential as a savant. I loved Sky’s character. She was so unsure of herself, she had so many doubts, yet she still wasn’t afraid to stick up for herself when she really had to. The scene where she stood up to Zed for the first time was absolutely cracking, I love it when characters stand up for themselves, even though they hate confrontation. And when Sky got together with Zed – wow. She just evolved into this great character, completely thrown in at the deep-end, as she has no clue what a savant or a soulfinder is. She’s managed to train herself to ignore her savant skills, and now that she’s discovered it’s not something to be ashamed of, she’s unsure what to do for the best. And Zed. Oh my goodness, talk about ultimate book crush. I can't even begin to gush about him, because I’ll never stop. But a musical, motorcycle riding bad boy? Send him my way, please. Sky and Zed’s scenes were brilliant, they leapt out of the page and were just written perfectly. The romance wasn’t overly gushy, it wasn’t twee, but it wasn’t fake either. I don’t know how to describe it other than it being perfect! Their telepathic conversations were great too, and the ‘lassoing the egg’ scene had me in absolute stitches!And I was so pleased to see Sky and Zed’s parents play such huge roles in this book! There was no missing parent syndrome in this book whatsoever. Being one of seven siblings kind of guaranteed that Zed’s family were going to be mentioned in some shape or form during the book, but I was so happy to see them taking a huge role in the book. They were the reason why Sky recovered from her kidnapping, and really helped her to accept who she was. Sally and Simon, Sky’s adoptive parents, were great too. They were ridiculously over-protective, yet it was so easy to see that they just wanted the best for Sky, even if they didn’t understand what the Benedict’s could offer her that they couldn’t. I found the plot in Finding Sky to be really engaging, and a little different too. 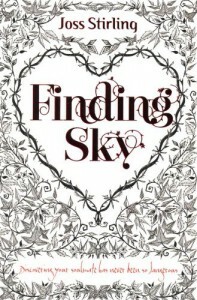 A large majority of the book was dedicated to Sky finding out who she really was, meaning that the title played a huge part of the plot too, which I loved. It thought it was great how the character development played a huge part of the plot, as it really allowed Joss Stirling’s writing ability to shine a lot. I loved how she managed to inject a good balance of humour into her work without it being too forced.Finding Sky was a total star find in my local library. I am so pleased I decided to start this series, and I cannot recommend it enough to everyone. Even if paranormal isn’t normally what you’d go for, there’s still something to appeal to you, because this isn’t your typical paranormal book. There’s something different and fresh in Finding Sky, which definitely adds to its appeal. So, what are you waiting for? Get your hands on a copy of this book!